The Midwest is famous for farmers markets, and Indiana has some great ones. Many of these markets are open year-round so you can visit when you've just got to have a fresh goods fix and can't wait until summer. Here are the 10 best farmers markets in the state. The Carmel Farmers Market in northern Indianapolis is a summertime hub of fresh fruits, vegetables, homemade nut butters and syrups, baked goods, teas and coffees, and even kitchen services like knife sharpening. The market takes place in the open area in front of the Palladium Theater, so if you time it just right, you can visit the market and then cap your evening with a wonderful show. It's more than a fresh foods market. It's a whole-living movement, bringing together whole, organic foods and handcrafted items. The second Saturday of the month during market season is “A Fair for the Arts,” a time when craftsmen can sell the fruits of their labor for the fresh-foods crowd. The market moves to Harmony School for the winter so you can get still get fresh foods for your Christmas dinner. In northern Indiana, the South Bend Farmers Market offers fresh fruits, vegetables, local syrups and honey, and even arts and crafts for a fully organic shopping experience. Not quite ready to dig into your yummy haul from the market, but so hungry you could eat a whole stand? Satisfy your hunger at the nearby café, which has been filling tummies and warming hearts for over 85 years. Every Friday evening, May through October, the Historic West Main Street becomes a farmers market with the freshest and brightest of local produce. On the street is the Mercantile on Main with distinctive and unique wares for your home, so you can also enjoy a little housewares shopping along with in-season ingredients for tonight's summer dinner. Also, keep an eye on nearby historic home tours, since homes along West Main have been featured by the local historical society for tours during the market. From April to November, you can enjoy fruits and vegetables that are only hours off the vine or tree, ripened to nutritious perfection. 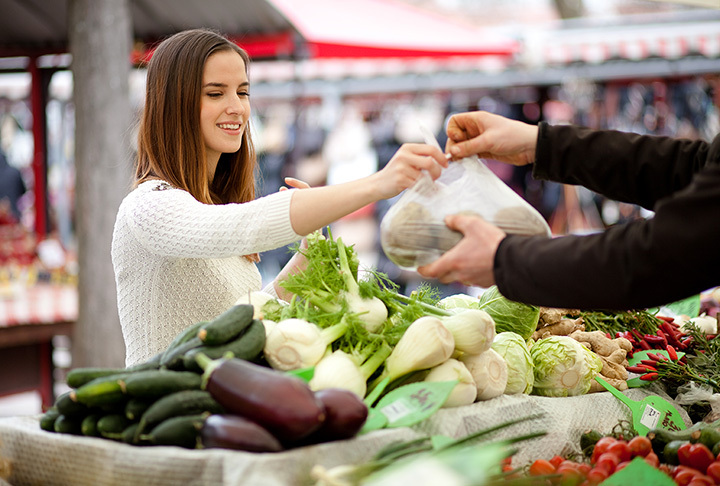 The market and all its vendors are dedicated to reducing the environmental footprint, providing local nutrition, keeping prices low, and feeding the community the good old-fashioned way … locally, naturally, honestly. A different offering from the usual fresh local produce, the Chesterton European Market offers world flavors with local ingredients. Breads and pastries, cheeses, meats and spices, even antiques and handcrafted vintage jewelry and accessories are made in the Midwest in Olde World style brought to you in the Hoosier homeland. A bouquet of locally cultivated flowers completes your fusion table. Are you a fan of supporting humane farming and organic agriculture? Are you a fan of lower prices on that organically cultivated product? Are you a fan of supporting growers who believe in putting the two together to give you a fantastic grocery shopping experience? Then visit the Kokomo Downtown Farmers Market and see your conscious-shopping dreams come true! Another reason to visit, as if you needed another one, is that the growers who supply this market offer varieties of produce you don't find in your big-name grocery stores, like red carrots, purple cauliflower, and even medicinal herbs and greens! You want a piece of northeast Indiana history? The Young Leaders of Northeast Indiana host a century-old area tradition … the farmers market at Barr and Wayne. Its location is Fort Wayne's oldest public space, near the original Barr Street Market began in the 1840s. The market is, according to the website, “producer-only,” meaning that the only people who sell you the produce are the people who produced the produce. Try saying that 10 times fast. This ensures the freshest, ripest, tastiest foods including fruits, vegetables, meats, dairy products, even baked goods. For a fun and family-oriented market shopping experience, visit the Owen County Farmers Market. Live music provides a cheerful soundtrack to your day browsing through local produce, meats, dairy, preserves, art and craft items, antiques, and even dog treats! What sets this farmers market apart from the rest, though, is their attention to the little ones. On certain days, a kids' lemonade stand open for business. They've rented the booth, they've supplied their product, they've set their rate, they've decorated the booth, and they've moved in to the booth specially crafted by one of the board members specifically for entrepreneurial kids. Beloved by locals and hailed for their competitive prices and off-the-charts customer service, Taylor's is a south-central Indiana summertime staple (especially for their corn). Woodwork, fresh flowers, and even giant fall mums await your browsing eyes at this farm market, and in recent years, fresh turkeys have been available for you to pre-order and pick up for your Thanksgiving Day feast! Talk about a meal you can really gobble up! View more Indiana Farmers Markets.